I've been super duper MIA. Sorry. I'm still having a hard time adjusting to my new schedule and weekly tasks. Since I left Branders,I hardly get enough sleep. I'm so busy with work, buying merchandise, taking pictures of it and busy with my new hobby---the art of make-up! Been watching a lot of youtube tutorials lately and it really inspired me to try and do it myself. I purchased a new brush set and I was excited to finally get my ebay orders last weekend!!! 2.) Mac matte foundation & powder - I use it to set my make-up after liquid foundation and concealer. I love it! 3.) Covergirl Trublend Whipped Foundation in Classic tan - looks chocolatey but when applied it feels silky smooth and just blends with any skintone. 4.) Chanel quad eyeshadow in beiges - I love the color of this palette. Just perfect for summer. 5.) Giorgio Armani set - it has 10 eyeshadow colors, 3 lipgloss and 2 blushes. Again it's mostly beige, browns and blacks. They are very much like the Coastal Scents palettes. I was told that they perform just the same. And they're very pigmented. So there, I'm sold. 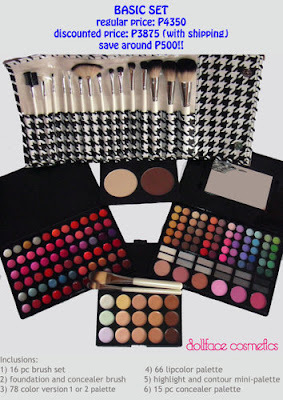 :) I promise Mich, after I get this I'm done splurging on make-ups.